The Friendship Project supports membership and copies of The Horn Call for hornists in countries where politics or currency restrictions make payment to the US difficult, or where low income is a barrier to membership. The original impetus came out of the Cold War between the East (mainly Russia and Eastern Europe) and the West (the US, because it is the headquarters of the IHS) when currency transfer was frowned upon or impossible. As the IHS expanded internationally in the 1970s, the Advisory Council, through the efforts of Frøydis Ree Wekre of Norway, recognized the difficulties people in some countries had in becoming members because of political or currency restrictions. Sponsorship by individual IHS members of individuals in Eastern European countries eventually led to sponsorship by the society of individuals from many countries around the world, with contributions by many members to the fund. In 1973, Frøydis sponsored memberships for Peter Damm (GDR) and Vitaly Bujanovsky (Soviet Union), both of whom lived behind the Iron Curtain and were unable to send membership dues to the US (and have since become IHS Honorary Members). In 1976, the effort became formalized into the West/East (WE) project, with Frøydis supplying the names of interested horn players from Eastern Europe and Western Asia. The members supported by the project were considered to be non-voting members and were sent The Horn Call and other selected mailings for one year. Shortly after becoming Editor of The Horn Call in 1976, Paul Mansur paid the dues for Vladimíra Klánská and continued paying for several years. 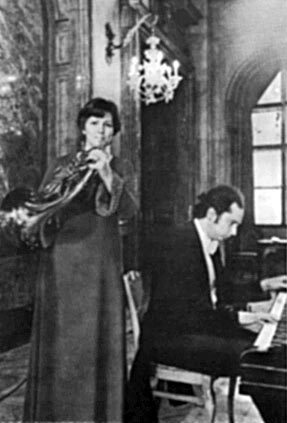 The following year, Vladimíra wrote a letter of thanks, enclosed this photo of her performing with her then-husband, Ivan Klánsky. Vladimíra was a featured artist at the 1994 IHS Symposium in Kansas City, and she is now a full regular IHS member. In 1983, the Advisory Council expanded the WE project to include other countries where people might need assistance (Latin America, for example). Memberships were paid out of the general IHS budget. In 1986, 12 memberships from Beijing were approved. In 1989, the IHS advertised for donations to support the project in The Horn Call and with a check box on membership renewal forms. In 1991, the name was changed to NorthEastWestSouth (NEWS) to reflect changes in the world situation and open the project to people around the globe. Many people have been supported by the project; in 1995, for example, NEWS memberships totaled 132. Contributions to the fund have not always covered the expenses, but the Advisory Council deemed the program to be an investment for the future of the IHS and supported the project from the general budget when necessary.